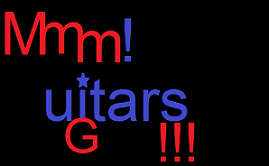 Guitar Sites Directory >> Resources >> Mmm! Guitars!!! A website all about guitars and music, with lessons, links and more! Here you can: read informative lessons, find useful downloads, you can also discuss with issues with other guitarists via its forum. This site is still under development, and they are working on improving and adding more interesting stuff.